Real Rice Sticks add a modern touch to rice made snacks. Made with brown rice and rice bran oil, and hot air baked, they are light, crunchy, and very tasty. Their unique mouthwatering flavours are hard to resist. They are perfect for light snacks, lunch boxes, and gatherings with family and friends. This crunchy premium rice snack will tantalise your taste buds. As I was not fond of the tumeric variety of this product I had high hoped for these garlic ones to have a better flavour. When I opened the packaging I could definitely smell the garlic, garlic is a taste I am very fond of and will use in a lot of my cooking so I instantly recognised the scent. With these packets you can reseal them for using later which is fantastic as the portion size is quite good and you would be able to save them without them going stale, plus I found the seal helped lock in the flavour. I like I did with the tumeric couldn&apos;t really pick out a garlic taste when trying these it was there if just a little muted but I really found a sweet taste of honey or something similar coming through a lot stronger and I found them a bit too sweet. As it was garlic sweetness for me just didn&apos;t work as I would not usually associate garlic with something sweet. The texture was spot on light and airy and easy to eat, and with some garlic hummus to calm down some of the sweetness they were not too hard to eat but as with the tumeric sticks they were not something I could eat a lot of. Out of all of the 4 flavours of rice sticks which I was lucky enough to be given for review the garlic ones were the ones which I was most looking forward to trying out. 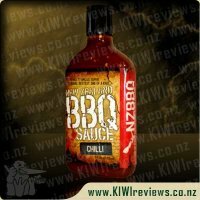 I always love adding garlic to my cooking and am a huge fan of garlic bread, making sure we always have this when having a BBQ, so this flavour sounded just perfect to me. 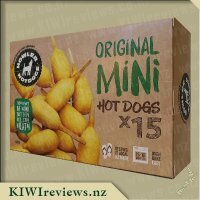 As I was unpacking my review goods I had my 4 year old sidekick by my side, when it comes to unpackaging goods from KIWIreviews she is never far from my side. She was busy picking up each of the items and having a look at them all before handing them to me, when she reached this particular she stopped for a moment and started calling the cat, I asked her what she was doing and she replied "getting Molly for one of these cat treats" she thought that these were cat treats, and I had to agree they did look a lot like how pet treats look. Sadly these didn&apos;t have the most appealing look to them from the outside of the packaging however seeing them from the open packet made them look even worse, luckily what they lacked in looks they made up for in taste (for those willing to try anyway). With a great resealable package these last for about 6 months once opened which is a great amount of time, not that they will last that long in my house. 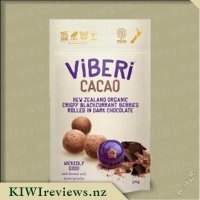 I love that they are such a healthy snack option being made from brown rice and being low in sugar which means they are something I would happily send to school with Miss 4 as part of her school lunch once she starts, and at such a great price it&apos;s totally worth doing so. 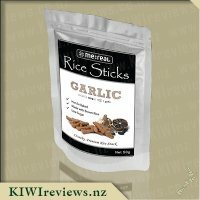 Garlic rice sticks were a product I have never heard of before and I was very interested to try these out. I am always looking for new products to add to my children&apos;s lunch boxes for daycare or snacks during the day so had thought this might be a product I could use for that. Unforunately miss 4 and mr 2 didn&apos;t at all agree and didn&apos;t like the taste of the garlic rice sticks (miss 4 even went to the extent of spitting it all out)! 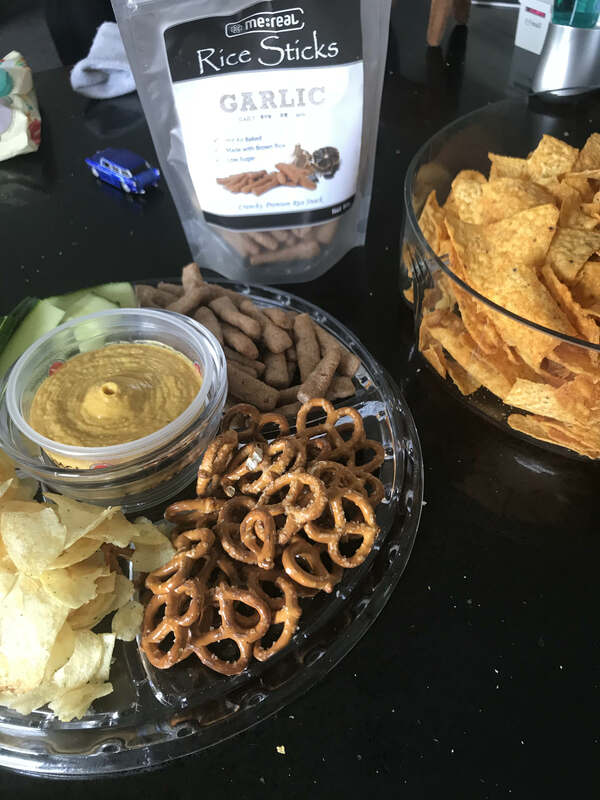 This didn&apos;t worry us though as my husband and I both liked the taste of them so we&apos;ve happily added a new product to our snack list! Having visitors round for a BBQ lunch I decided this was the perfect time to try out a new product with a range of tasters... the youngest being two x 2year olds and the oldest being 60+ years old. Between the 13 of us, we easily managed to make a good 3/4 of the packet of rice sticks disappear. I had put these onto a platter tray alongside pretzels, chips and cucumber sticks with a hummus style dip in the middle. The 2year old&apos;s and younger children weren&apos;t fans of this product at all however the other half of us all aged 13years upwards enjoyed this product particularly when mixed with the hummus. This product isn&apos;t the most inviting looks wise however texture and taste is a different story thankfully. The rice sticks are really light and crunchy, making you immediately reach for more. The taste, is quite bizarre to be honest... for me personally, I can taste the flavour of brown rice (which isn&apos;t a bad thing) and also the garlic flavouring and then there&apos;s also another something which I can&apos;t quite put my finger on. 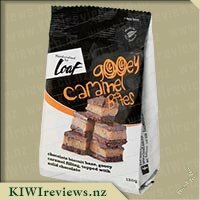 It&apos;s almost like a sweet, brown sugar or caramel flavour, it sort of makes the product taste like caramelised onion or garlic. 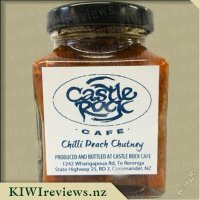 It&apos;s not a bad flavour at all and is one you really need to try for yourself to decide whether it suits your taste buds or not! To be honest I&apos;m not a huge fan of the colour scheme of this product. The red of the "Hot & Spicy" variety made it stand out, but the darks and browns really make the product look dull and unappetising. Looking at the rice sticks themselves, then looked like old and shrivelled up chicken sticks that you get from the petrol station cafes; almost like some sort of dried pet food. The looks combined with the smell once I opened the packet (reminded me of a plastic rubber smell), needless to say, I wasn&apos;t really eager to try it anymore. If it was sitting on the supermarket shelf, I wouldn&apos;t have picked it up, that&apos;s for sure. There are a surprisingly minimal number of ingredients in this product, with 90% of the product weight coming from brown and black rice. This would explain the brown colouration of the rice sticks. Throwing a couple of the rice sticks straight into the mouth there is a definite earthy garlic feel to it. and licking my lips afterwards, there is a definite sharpness from the garlic, but the garlic flavour is overpowered completely by the sweetness of the product. The sugar and sucralose provide a sweetness that lingers long afterwards in the aftertaste. Looking again at the ingredients, the rice takes up 90% of the weight, black garlic powder takes up a further 5%, and the next largest ingredient is sugar. Judging by the taste of the product, I imagine it can&apos;t be much less than 5% (Around 3.7% if you look at the nutritional information). I&apos;m just really not a fan of the sweetness. Not at all. I love garlic, so when I eat garlic flavoured products, I want a strong flavour. 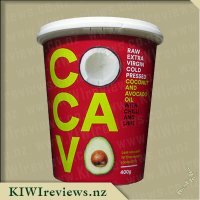 If they reduced the sugar content down, it would improve the flavour, and reduce the calorie content of the product and cost of ingredients as well. But as it is, it&apos;s not a product I will look to try again. I am always keen to try new snacks so I thought Garlic Rice Sticks from me:real sounded like something that I would like. The packet said they were hot air baked, made with brown rice and low in sugar so weren&apos;t going to be too bad for me but I also hoped this didn&apos;t compromise the flavour as it does so often with other products. I read the ingredients and thought I looked like it was a gluten free product but it didn&apos;t say that anywhere on the packet. I showed my sister who is gluten intolerant and she agreed it was gluten free but it probably hadn&apos;t been certified or may be made on the same equipment as products containing gluten. For this reason she wouldn&apos;t recommend it for celiacs but it would be suitable for people like her that can handle a little gluten. Unfortunately she didn&apos;t try these snacks as it was Christmas Day and she was already full. I liked the taste of the rice sticks and didn&apos;t find it was too strong but my 7 year old daughter wasn&apos;t keen on the flavour. 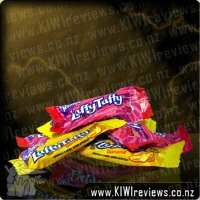 They had a nice crunch to them but not so much you would be embarrassed to eat them around others. I could taste the garlic but wasn&apos;t worried about my breath. It is one of those foods if you didn&apos;t read the packet you wouldn&apos;t know it was a healthier option. I thought the packaging was very handy. You could see what was left in the packet or if you were buying crumbs rather than sticks (not that it was a problem for us). It was also resealable and when I returned to finish off the packet two weeks later the rice sticks were still really fresh. 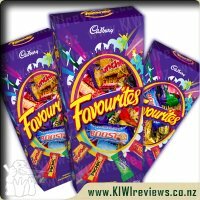 I will be buying these to add to a gift basket for my sister or to share with her as it is often hard to find different snacks for her. Our family adore Garlic it is very rare that you find a meal that does not have some hint of garlic added to it. 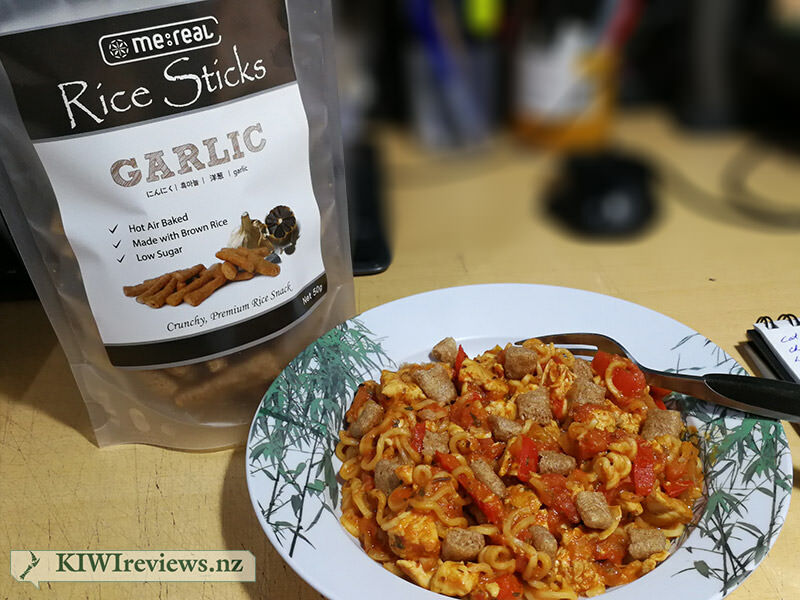 When I saw this up for review I tossed up whether we should try them because to be honest as much as I love my rice meals I am not a huge Rice Stick fan but since it had garlic in it I figured why not. Preparing Christmas lunch yesterday I needed something to nibble on while cooking as the food and smells were driving my taste buds insane. I decided to try this and asked my husband first if he wanted some. Taking one out he ate it and his eyes grow wide and said &apos;yum I could murder a packet of these all by myself&apos; as he took a handful out. My two little scavengers popped there heads up and quickly come to try some, they both said &apos;ewww they look weird but they are garlic so they can&apos;t be that bad&apos; (my thoughts exactly) and tried and both said they taste so good. So I finally decided to give it a go and even I thought &apos;wow&apos;. For something that does not look visually appealing they actually taste really good. Once you get the idea out of your head that it is Brown Rice Sticks they are really good. They are crunchy yet light. My husband has already put in a request saying that he would like them for his lunches and both girls said they would too - so an absolute hit in the house. My husband did comment he did not understand why they needed to add the Sweetener (Sucralose) to it as it would already of been rather sweet besides that complete positive comments from everyone. 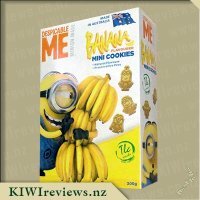 Also love that the packet is resealable so these will be perfect for snacks at the beach in the awesome Kiwi summer we are having. 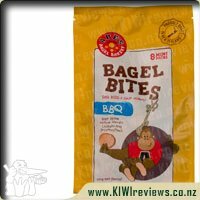 I adore garlic, it&apos;s a staple in my kitchen and used almost everyday, so I was keen to try this new snack and see if it had a nice garlic flavour to it (I&apos;m usually dissapointed by the lack of garlic). I noticed immediately that this is a resealable packet, something which is always handy though the plastic didn&apos;t quite want to rip for me. I like getting snacks that are low in sugar but haven&apos;t liked brown rice in snacks before so was dubious about how this would end up tasting. Miss 8 wanted to get right into tasting and gave it much thought but ended up saying that she didn&apos;t really like the taste so didn&apos;t want any more. I decided to share these with my mum and she liked the sound of garlic so grabbed herself a handful. She ate them all but more because they were in her hand than actual enjoyment and declined having any more. While she was trying them Miss 6 came down and took a small bite of it before giving it two thumbs down and running to the bathroom to spit it out. My mum and I discussed what we thought of it and both agreed that we found it too sweet and it just didn&apos;t give us any garlic taste at all. I had to google black garlic, so would have liked a little info about that on the packaging. Neither of us really enjoyed this and both agreed that this won&apos;t be something that we would eat again, though it was good price wise. So the picture on the packet looked a tiny bit like dog food to me so I was not expecting much from these. But I have to admit they completely delivered. 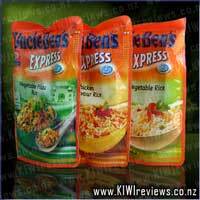 The sturdy packet stops the rice sticks breaking up. and the container is resealable which is helpful (but not able to be recycled which is a shame). I used them all in one sitting so I never did reseal the packet. The volume was really good and bigger than the bowl I thought they would fit in which is great. There was a clear garlic smell when they were served which was lovely and made me quite excited to try them. I do enjoy garlic as a flavour and although this didn&apos;t taste too strong it was clearly in the garlic family of tastes - more of a roasted garlic vibe. I do have to admit I would probably mix them with something else for a visual look that is a bit more attractive. This is why I have not included a photo as I felt it would not do the taste/texture and generally good things justice. The flavour was strong and just a little bit sweet. Almost a taste of caramelised onion about it which was great. The taste was not too heavy and we had a lovely alternative to potato chips. I will definitely be including these for my gluten-free friends as they are very tasty. 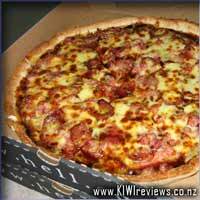 The texture is ideal - light and crunchy with lots of consistent flavour. I would totally recommend these as long as you want to eat them in the dark as the look needs a bit of work... maybe they would be best as an accompaniment to something else which had a bit more colour. The shape was good for easy picking up though. So... garlic. When I think of garlic, I think of stir-fry, when I&apos;m not thinking of garlic bread with cheese but obviously that one isn&apos;t going to work with rice sticks... so, stir-fry. I had some diced chicken in the freezer I was thinking of having for dinner, so I thought "Why not" and whipped up an experimental dish with onion, capsicum, tomatoes, a packet of 2-minute noodles and a generous handful of these rice sticks broken into thirds. Frying the onion and capsicum with some pepper and salt until tender, I tossed in the chicken bits and swished them around until they were almost cooked. In went the tomatoes, roughly 3tsp of mixed dried herbs and the broken-down brick of noodles along with about half a cup of chicken stock and half a cup of milk, lid on, simmer away with the occasional stir to prevent it sticking and burning. With a few minutes to go and almost no liquid left, I threw in roughly a quarter of the pack of rice sticks after chopping them into thirds, took the pan off the heat and left it for 2 minutes. Just 15 minutes after I had started chopping onions, I had a very generous meal - enough for 2-3 portions - that tasted amazing! The rice sticks made great croutons, adding a wonderful texture that didn&apos;t interfere with the flavour of the meal at all. While I can&apos;t say for certain that it added significantly to the taste, I was able to detect garlic in there fairly easily, especially when I bit down on a crouton. I also had a few on their own, and while nice enough, I found they were a little bland for my tastes. That said, I have always leaned towards full-flavoured foods and &apos;delicate tastes&apos; are not my usual fare. Would I buy these in future? Quite possibly. I have enough left that I want to experiment with them in a Summer salad - again reprising the role of crunchy crouton - as I suspect they will fare much better in that format. By the end of my stir-fry meal they had become quite soggy. Still, they did well and I respect the fact they are far healthier than many, many other snack foods out there. 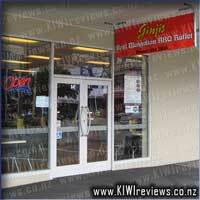 Well worth exploring, especially if you have ideas on experimenting with Asian-inspired cuisine. I shared this packet with a friend who was keen to try them for herself - she had heard about them already and is a great fan of anything containing garlic, so she put her hand up immediately to help me review them. She already had some ideas on how we could serve them, and I was happy to go along with her as her ideas are usually pretty good. Her first comment was on the packaging. She loves packs that are resealable as, like me, she travels a lot and likes to have no-fuss openers. There is nothing worse than having to fight with a difficult seal only to have it burst open and scatter the contents everywhere. Worse still are those packets that have an arrow with a "tear here" notice but neglect to tell you the slit is non-existent so you just end up attacking them with the scissors anyway. The tear strip on these packs is really easy and the reclose function is sturdy and easy to use. Then we sniffed the contents. I always do this as I want to get a first impression of the product inside, but she thought this was rather strange. However, she followed suit and reported back that there was a definite whiff of garlic although it was not quite as strong as she had anticipated. Then came the first taste test. The crisps were very nice, lighter than we expected from a rice product, and much more garlicky than the sniff test had suggested. We then divided the contents into three. The first portion was to be served with an off the shelf feta and spinach dip with some small pieces of smoked salmon stirred through. This combination was utterly delicious although the garlic was slightly lost to the feta; there was some competition for flavour. I quite liked the mix, but after we had tried several crisps dipped in it we thought there was room for improvement. Probably a less highly flavoured dip might have been better. We had the second portion with a mug of home made chilled pumpkin soup with a blob of cream. This was a lovely choice and one we would have again. The crisps were served on a separate plate, but both of us tried dunking a couple and agreed that this was a great way to have them, slightly messy and very decadent! Best not eaten in polite company however as they tend to drip. 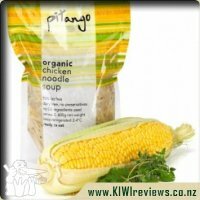 Possibly a good choice for a beach picnic with the soup travelling in a chilly bin to keep it cold. Finally, the best of all. 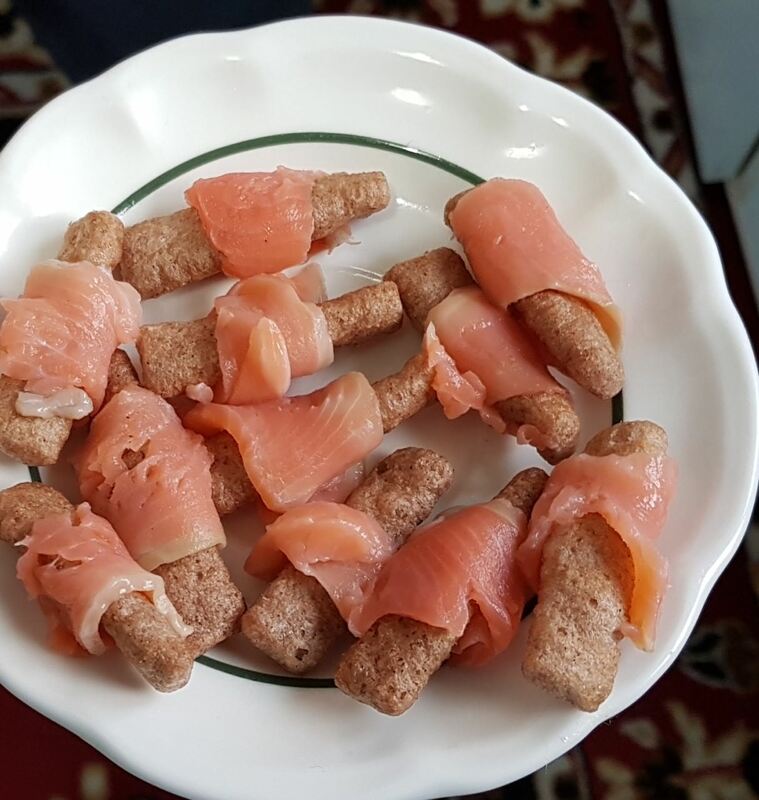 Inspired by the devils on horseback idea, my friend used the larger pieces of salmon to wrap around the crisps; this was served with a small glass of port. I would not have thought of doing this, but it worked really well and they were so quick and easy to prepare. The crisps on their own are not especially attractive to look at - in fact, if I were serving them plain, I might be tempted to set them out in a pattern on the plate so that they would draw the eye. But with the salmon they looked superb. Another idea to file away for entertaining purposes, and another food I will certainly be purchasing again..
Organic freeze dried blackcurrants are rolled in organic premium Belgian 70% Dark chocolate to give your taste buds an enlightening experience, then dusted with powdered Cacao.